Auckland woman taunts Police searching for her. An Auckland woman has taken to Facebook to publicly taunt police who have a warrant out for her arrest. 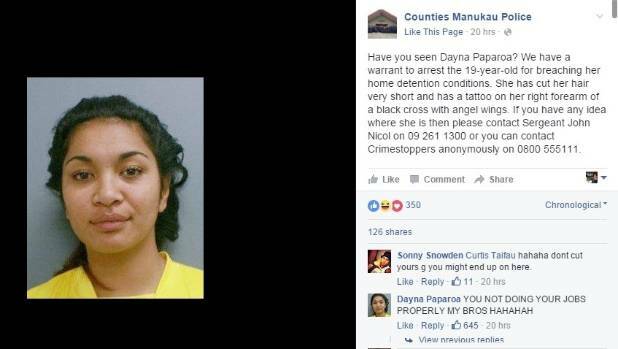 Counties Manukau police posted a public plea on their Facebook page for information on the whereabouts of Dayna Paparoa, along with a mug shot of her. “She has cut her hair very short and has a tattoo on her right forearm of a black cross with angel wings,” police wrote. Police have a warrant to arrest Dayna Paparoa for breaching home detention conditions. The 19-year-old is wanted for breaching her home detention conditions. Minutes after police posted about Paparoa on Facebook, a person with the same name commented: “YOU NOT DOING YOUR JOBS PROPERLY MY BROS HAHAHAH”. Paparoa then insinuated that she would smoke marijuana first. She then proceeded to engage in various conversations within the comment thread, which has been shared and liked hundreds of times. Police said it would only be a matter of time before Paparoa is caught. “In situations like these, it’s inevitable that they will be apprehended,” said senior constable Garry Boles. Boles said this is not the first instance of people commenting on their own wanted posts on Facebook, but it does slow down the official process. Previous Post: [Watch] What if Superman punched you? I think Batman is in over his head! Next Post: [NSFW]Check out the trailer for Popstar: Never stop stopping, and you may wet yourself.